Gandhiji Dapp is a Decentralized Token Economy built on the Ethereum Blockchain providing financial censorship resistance in a time when India chooses to Ban Crypto . Holding Ethereum in the Gandhiji smart contract will earn you dividends in ETH each time the economy is used by anyone. The technology that this dapp is built with means no Government, Country or organisation can stop you from interacting with it. You will always be able to use every feature of the dapp by connecting directly to the ETHEREUM Blockchain. 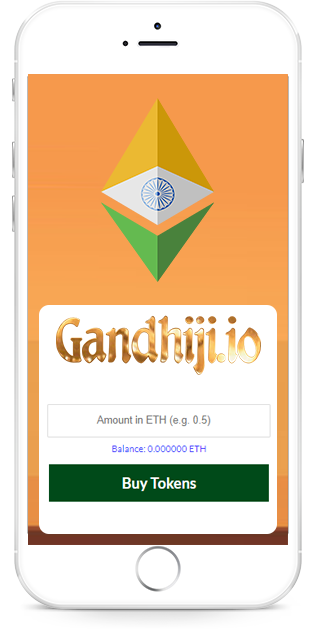 The Gandhiji Dapp is one of the Longest standing Ethereum Dapp projects in the space with a fully verified and Audited Smart Contract. Gandhiji has no owner or Administrator making it the first smart contract of its kind to be decentralized in this fully autonomous way. 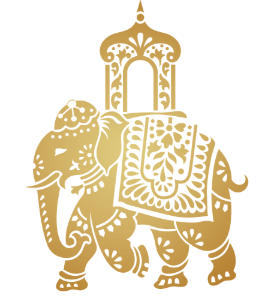 The smart contract manages all aspects of the financial mechanism of the token economy and the contract is the highest power in the system, due to this unique feature there is no human control or interference possible in the Gandhiji Smart contract. Period. The IND Token Economy is built on and pegged to Ethereum. This means your IND tokens can ALWAYS be redeemed for Ethereum from the smart contract directly. As the value of Ethereum rises so does the value of IND tokens. Every trade, buy, sell or transfer, has a 10% flat transaction fee that is rewarded in dividends to all of the IND token holders as believers in Gandhiji. In this Dapp space this has proven to be not only the most successful but also the only sustainable concept to date. 10% of the volume this cryptocurrency ever experiences is redistributed back to the token holders as Ethereum rewards, that can be instantly withdrawn from Gandhiji. The Gandhiji smart contract or developer takes nothing for himself. Completely decentralized, Humans can’t shut it down. Gandhiji Smart contract is verified on the on the Ethereum blockchain and is fully transparent and open source. The code is backed by the Ethereum network, feel free to take a look at the divine mathematics and logic, the code is open for all to see. So as long as the Ethereum network exists so will the Gandhiji Dapp. Every transaction is handled by a piece of un-changeable blockchain programming known as a smart-contract called Gandhiji. Decentralised Democracy has finally arrived. For each IND token added or removed from circulation the price of the next token increases or decreases automatically by a fractional amount of ETH (about .0000001 eth). When people buy, your IND tokens are worth slightly more, when they sell, slightly less. This is managed and calculated by the smart contract directly. Gandhiji smart contract will manage the economy but cannot affect the price of the token. That is locked in the code and set on the blockchain, the price will rise and the price will fall, those who trust in Gandhiji the longest will be rewarded the most. Selling IND tokens is like saying that the trader has lost faith in Gandhiji. Simply put, when someone chooses to sell or trade tokens, a 10% transaction fee is applied. That fee is split across all tokens currently in circulation as a reward to those believing in Gandhiji and not selling IND tokens. 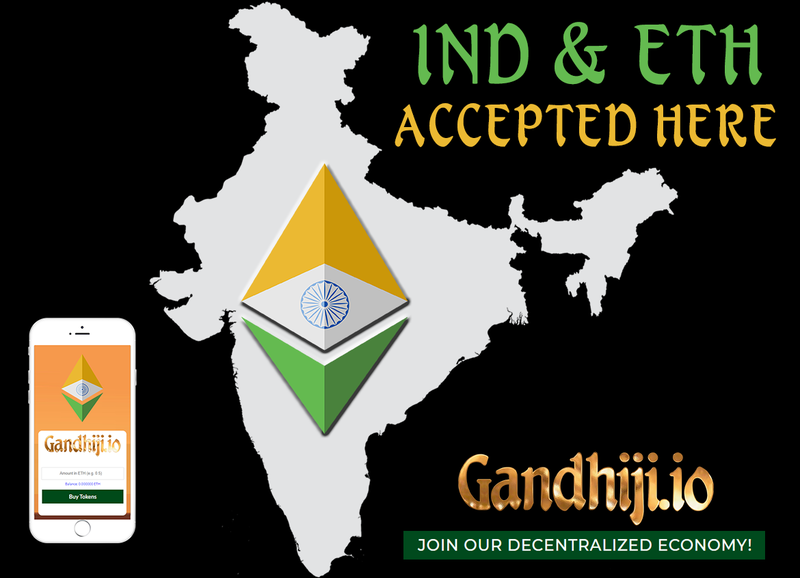 Anyone who holds IND tokens can withdraw their share of those earnings anytime, in Ethereum from Gandhiji, no fee attached. The first true believers in Gandhiji will surely gain the most. 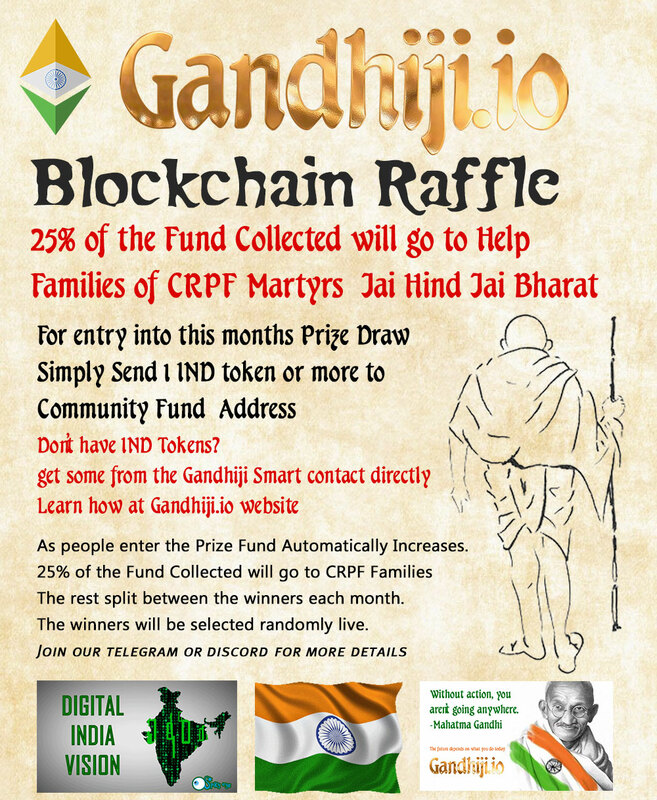 In addition, if you hold just 1 token you can earn instant eth rewards for your good karma in spreading the word about Gandhiji. 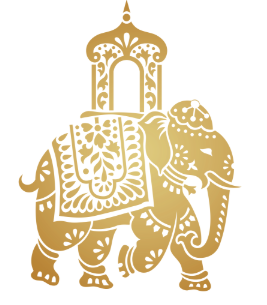 Your Karma link gives you a unique link to our website that Gandhiji recognizes, anyone buying into Gandhiji via your link has 33% of all fees they would otherwise pay into Gandhiji, directed to you instead as instant karma Ethereum gains. This is the active-gains component of the contract, Gandhiji lets you build your own network that rewards you! The selfless Gandhiji holds all Ethereum ever put into purchasing these tokens in his pocket and will democratically give you all Ethereum you are owed whenever you want to withdraw or sell your IND tokens. That’s if you are a non-believer of course. 10% of all volume is given as dividends by Gandhiji and is democratically split out as Eth to all IND token holders. Karma links allows you to recruit more believers and get instant ETH rewards, plus everyone gains from the volume! Each IND token has intrinsic value, as every token is backed by the eth already held in the smart contract. India is a country of over 1.5 billion people. The Gandhiji Dapp was created to help support the migration of people into the crypto space. The Gandhiji community regularly raises funds and donates to various organisations in India. 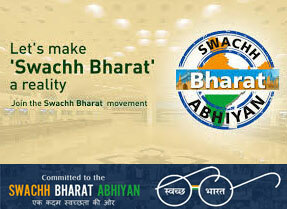 Swachhbharat Abhiyan is an obvious great initiative to help improve the daily lives of many people across the whole country. Join the Gandhiji community to learn more . How to use this Dapp. The longer you hold IND tokens the more value they will gain for you. Purchase Tokens Directly from Gandhiji using Ethereum. That’s it, you’re a believer now. With continuous volume you’ll receive a steady flow of ETH for as long as you have faith. Don’t give up, you really can only lose when you sell you tokens. Anywhere that you have a unique opportunity to direct others here, use your unique Karma Link.